For aspiring entrepreneur Vivian Bomberry, the irony of the term cohort — used in education circles to define a group of students in the same class year — wasn’t lost when she began her studies in the Ch’nook Advanced Management Program at UBC last November. Seven months after her foray into coursework devoted to marketing, finance, business strategy and operations, Bomberry would be one of twelve students to complete the Aboriginal business program in its inaugural year. Originally from the Six Nations Band in Ontario, she now resides in Surrey, B.C., where she is focused on starting her own jewelry business. The Ch’nook Advanced Management program, launched last November, combines Aboriginal values with business skills and entrepreneurship education in part-time studies. 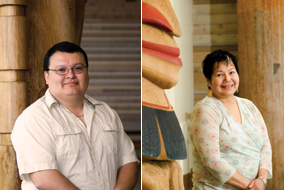 Classes are led by a group of distinguished First Nations leaders, senior faculty members from Sauder School, as well as entrepreneurs who share their stories of success and failure. The program comprises team projects, assignments, and class discussions. Program leaders are hoping to make an impact on the future of economic development for First Nations. Unlike traditional business education programs, this one integrates the insights of Aboriginal leaders in a setting that its participants can easily relate to. Visitors to the program include business and finance firms such as Odlum Brown, Tale’awtxw Aboriginal Capital Corporation, VanCity and Kryton Group. The Ch’nook programs are a collaborative effort between UBC First Nations House of Learning and the Sauder School of Business at UBC, and include business diploma and degree options and scholarships. The Ch’nook name is a variation on the word Chinook, which was the local jargon language used for trade between First Nations, particularly up and down the West Coast. In addition to its Advanced Management Executive Education Program, the Ch’nook initiative at UBC is home to the Ch’nook Scholars Program — supporting full-time business diploma and degree studies for First Nations students in British Columbia. The four major components of this program are financial support, Aboriginal-focused coursework, career mentoring and internships. This summer, Ch’nook student Jarnael Payer — a student of Langara College in Vancouver — is cutting his teeth with one of Canada’s oldest independent investment management firms — Phillips, Hager & North, which manages over $65 billion in financial assets. Jarnael’s internship with PHN involves conducting research devoted to investments on the New York Stock Exchange. In addition, he’ll have the chance to experience the workings of a fast-paced investment firm.